I am sure many of you have seen the sign on Lakeland Drive by Kirkland's Home Furnishings. Shipley's Donuts Coming Soon! That which I have longed for shall soon come to pass. No longer must I wait until Southern Miss game days to partake in the glory of a Shipley's glazed donut. I don't know if this will damage Donut Palace's corner on the market in the Castlewoods area, but I'd be nervous if I was Pillow Donuts. The Rankin County Sheriff’s Office and several police departments in the county are offering their parking lots as “Safe Zones” for “Craigslist” type transactions. Sheriff Bryan Bailey and several of the police chiefs in Rankin County are hoping the public’s new place of choice for transactions will be the law enforcement agencies parking lots and/or lobbies. The Rankin County Sheriff’s Office parking lot and lobby, as well as many of the police department parking lots, are under 24-hour video surveillance and have constant flow of police officers in and out at all hours. Sheriff Bryan Bailey believes this will prevent robberies and violent crime, and hopes it will make people feel safer. Your coat and tie choking you? Local boys, Luckenbach, the Willie Nelson Tribute Band, play both before and after the Saturday, August 29, 2015, M-Braves v. Biloxi Shuckers game. They crank up at 3 p.m. until game time, and then will play one more set after the game immediately after the fireworks show. They don't need their name in the marquee lights, they just need you. Check out the band's Facebook event page for more details. At this stage in the game, this post is strictly rumor, but it was substantive enough to publish. Today, the gas station behind Walgreens on Hugh Ward Boulevard opens. To entice folks to stop by, they are offering gas at an introductory rate of $1.85 a gallon. If anyone can verify this on their way into work, do so by sending me an email at usmjacksonalum@yahoo.com, and I will update the post. The Seafood King, beside the Safe-Store Self Storage facility on Lakeland Drive (across from Mill Creek), is apparently going the way of Cajun Crawlers, and will soon be replaced by T'Beaux's Crawfish and Catering. T'Beaux's presently has two locations, one in Clinton, and one in Byram. When they open up, I don't know. I attach a pic of their Byram menu. I imagine the Flowood location will be substantially similar. Chris Walker officially announces his candidacy for the newly created Circuit Court Judge seat, encompassing Rankin and Madison counties. Due to increasing population growth in our two counties, the Mississippi Legislature added an additional Circuit Court Judge for the 20th Circuit Court District. It is my desire to be your new Circuit Court Judge. Daniel Cross won yesterday's run-off election for the District 2 Supervisor's race. With one write-in vote, that is a total of 2,873 votes cast in the District 2 race. On the flip side, Steve Gaines edged Kenny Miller to win the District 4 Supervisor's race 1748 votes to 1421 votes. I cannot find a precinct-by-precinct breakdown of the vote. Once that is made available, I will publish for you. Three weeks ago, there were a total of 5,646 votes cast for Supervisor District 2. But that is not the Stat of the Day. Here is the Stat of the Day: Rankin County Democrats held a runoff election for Transportation Commissioner. Every one of the 50 precincts in Rankin County was open for voting. A grand total of 359 Rankin County Democrats felt the civic obligation to cast a vote. And here is the link to Anna Wolfe's article in the Clarion Ledger. The mad, morning rush is over. By 7:45 a.m., a grand total of 11 had voted at Reservoir West. There appeared to be a bad wreck on Spillway at the intersection of Old Fannin Road. If you were planning on heading that way, take the time to vote (you're going to be spending it anyway). I'll be live-tweeting (@usmjacksonalum) the votes as they are counted at the EOC Building this evening. Polls close at 7 p.m. Rumor of the day: Panera Bread Company is coming to the old El Sombrero location in the Dogwood Promenade. Anyone else heard this? Homer Burns, stalwart community organizer in the Reservoir area, provided his own endorsement in the District 2 Supervisor race this morning. The Supervisor is one of the most important elected officials in our county because his decisions impact our daily lives. A supervisor oversees issues concerning zoning and land usage, drainage, potholes, nuisance property, roads, bridges, and infrastructure, garbage pickup, ambulance service, and mosquito spraying, among others. Derrel Palmer finished third during the party primary on August 4 for District 2 Supervisor, with a respectable 26.3% of the vote. Yesterday, he endorsed Daniel Cross for supervisor. I've intentionally stayed away from endorsing either candidate in the runoff for District 2 Supervisor, but I've decided it's time to go public with my support. While I will always believe the best qualified and hardest working candidate did not make the runoff, I still believe Rankin County needs change. In my opinion a vote for Brown is nothing more than keeping the same thing we've had, old time, good ole boy Rankin County politics. I reached out to ALL segments of our population, from the Tea Party to Eddie Dear's group All Citizens of Mississippi because I firmly believed everyone needs and deserves representation! But, I couldn't beat the "machine" that is Rankin County politics! Without big money and family name, the common person doesn't have a chance. All that being said, I believe Daniel Cross will best serve the citizens of District 2 and I will support him and help him any way I can. My Prayers go up for Rankin County and I look forward to whatever God has in store for me next! A total of 5,640 cast their vote in the GOP primary on August 4 in District 2. Anyone care to guess the total votes tomorrow? For those eager to cut their acting chops, don't forget about the extras needed Sunday for "Blunt Vengeance". Per request, the previous post with all the information I know about it is here. Tonight is the Northwest Rankin Cougars' first home football game. NWR takes on the Germantown Mavericks at 7 p.m. Ever wondered whether a particular river or stream was a public waterway? As a kayaker, I sometimes wander off the beaten path and into unknown waters. The Mississippi Department of Environmental Quality is the arbiter of the public waterway designation. They have a handy-dandy map available on their website to assist. Though I post said map below, I recommend you follow the link for a more detailed version. Of particular local interest, Pelahatchie Creek remains public almost all the way to the City of Pelahatchie. Also, the Strong River becomes public way up in Smith County. Stinky Feet Athletics is the precisely the type of locally owned small business we need in our area. I am thankful the owners and employees feel a desire to give back to the community, and to do so in a way everyone benefits. They go above and beyond. One of the ways they do so is by hosting a monthly $5 5K for a good cause. It's not timed. No one is out there to win a trophy. No one is out there to show you up. It's just your friends, neighbors, coworkers, etc., getting together at 6:30 p.m. at Genghis Grill on the third Thursday of each month. They pay $5 for a good cause, and then walk/run 3.1 miles up and down East Metro Parkway. It's fun. It's exercise. It's community at its finest, and its tonight! A passion of ours at Stinkyfeet Athletics is supporting “local” ministries doing KINGDOM work. One of the ways we do this is through our Monthly $5 5k. Its simple, come and run with us and donate $5 to the charity of the month. ALL money collected goes to the ministry or organization. Come out and join us to raise money for the family of Jenna. She is a 5 yr old heart transplant recipient. 20% of your food bill at Genghis will go back to Jenna’s family as well. I welcome emails from readers with information on upcoming events in the Reservoir area. That is how I obtain much of my information. Keep them coming! Below is an email received concerning Gospel Night at Lakeside Pres. Gospel Night - Join us at 6:00 p.m. on Sunday, August 30, for a Gospel Night of Singing at Lakeside Presbyterian on Spillway Road! We will be featuring music by JES Southern, the Lakeside Choir, small ensembles and soloists, as well as congregational singalongs! We will be featuring gospel favorites such as “Precious Memories,” “Do Lord” and “Farther Along.” We will meet in the Lakeside Fellowship Center for a dessert fellowship following the program. We hope to see you there! A Rankin County Deputy officer was involved, and injured, in a crash last night on the Madison County side of the Spillway. The officer was involved in a high speed chase when his car crashed into a guardrail. From the stories, it sounds like the guard rail near the Breakers. The car he was chasing was a dark colored, late model Honda Accord. Apparently witnesses wrote down the tag number. The officer was taken to UMC. His current condition is not known, though his injuries are not expected to be life threatening. WAPT Facebook page with a few photos from the scene. A Five Guys cheeseburger, "all the way", with a side of sloppy, grease-dripping fries, is one of my secret indulgences. The first sign of grease bleed-through in a brown paper bag, and you know its good. Plus, the burger, and all the fixin's, do that even attempt to stay between the buns. So good. The NWR HS Junior class found a way to take advantage of my burger covet with a fundraiser hosted in conjunction with Five Guys. 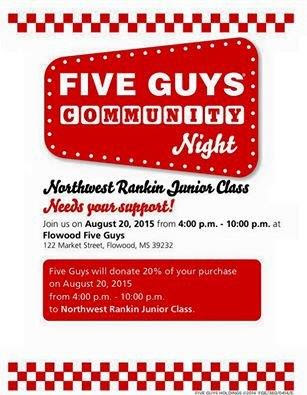 If you are having trouble reading the pic below, 20% of all purchases at the Flowood Five Guys on August 20, 2015, between 4 p.m. and 10 p.m. will go to the Junior class. I truly believe in the importance of service to others. We are not here just to make a living, we are truly obligated to make this world a better place than we found it. I have spent my youth and adulthood in this district and have personallyexperienced its transformation from a sparsely populated community to a heavily populated and rapidly expanding economy with all the inherent problems associated with that growth. Over the years I have witnessed good leadership and poor leadership exercised by our elected officials and never cease to be amazed at the wide divergence of the outcomes they produce. Things move much faster now. We need bold, mature and courageous leadership- leaders who cannot be bought, bartered or badgered by special interests bullies. I believe I offer the talents of a long time first responder who has dealt with large public budgets, who has developed skills in allocating scarce resources to the highest priority needs, who has personally negotiated with legislators for better laws, who is intimately familiar with the public infrastructure of this district, who knows first- hand the importance of reducing crime, who has directly been involved in lowering our fire insurance rates, and is fully committed to keeping our roads and bridges modernized, our water and sewer systems efficiently maintained, and our property values protected. What jobs have you had that qualify you for public office. Last week, the Rankin County News provided a public service by asking the two candidates for District 2 Supervisor a few questions about their qualifications and intentions in office. I post Kyle Brown's answers here. My background in economic development makes me uniquely qualified because I work on issues from land use to zoning to transportation on a daily basis. I know that to build a strong county we must continue to invest in infrastructure, continue to have strong schools, and keep taxes low so we can bring more and higher paying jobs to Rankin County. What jobs have you had that qualify you for public office? Both Supervisor candidates are busy raising funds for the last push. So, a local production company is filming a scene from the movie "Blunt Vengeance" at the Reservoir Community Center on August 23, and they need extras. No word on whether Jean Claude Van Damme or Steven Seagal will be there to assist. Saint Studios is a locally owned and operated Mississippi independent film company dedicated to bringing you the very best in moviemaking. Founded by Curtis Everitt in 2008, Saint Studios tackles a variety of genres when making movies. These include action, comedy, drama, fantasy, heist, horror, mystery, romance, superhero, thriller, and Western to keep the movies fresh for the viewer. Saint Studios has featured actors such as Jerry Clark (The Maze Runner and Pitch Perfect 2), Jessy Hughes (The Sound and The Fury), Josh Powell (Rumors of War and Dallas Buyers Club), Jeremy Sande (Oblivion and Nashville), and many others. Two things I want to update my readers on with the Reservoir YMCA. First, Blastball registrations are ongoing through August 31. Blastball is a rite of passage for all parents in the Flowood/Reservoir area. Registration form below the jump. 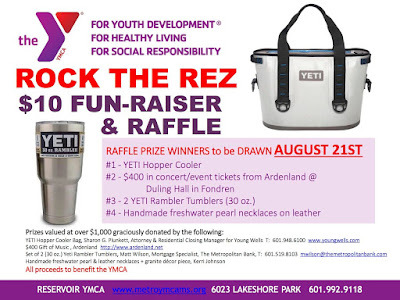 Second, the Rez YMCA has a "Rock the Rez" raffle going on. See pic below. Good prizes, if you like cold drinks and good music. There is an important vote affecting the Reservoir area on August 25. Daniel Cross and Kyle Brown are in the run-off election for Supervisor, District 2. Both will be having fundraisers and other campaign events this week and next. Daniel starts it off tonight at the Castlewoods Clubhouse from 5 to 7 p.m. Check out this picture submitted to me by a reader. 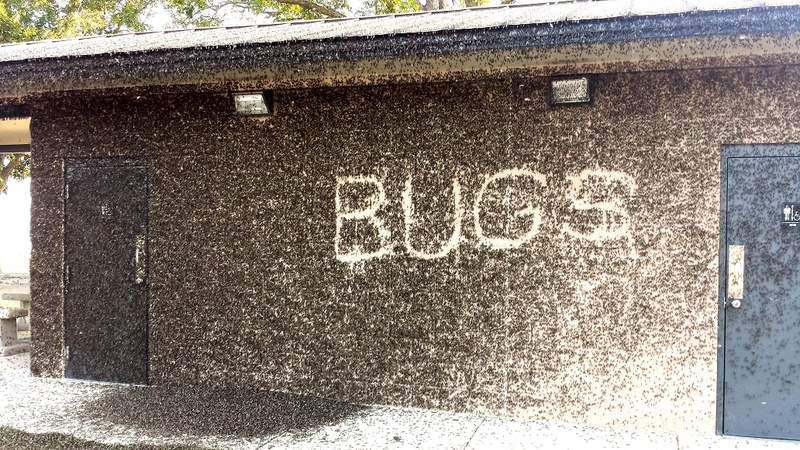 Those are mayflies, and that is the new bathrooms at Fannin Landing. Thanks to Michael Robinson for sharing. How about this blast from 5 years past. You have likely heard the hype about CSpire's "Fiber to the Home" product, which is promoted at 100x faster than the national average internet speed, unlimited bandwith, with a step up in quality over Uverse and/or Comcast, etc., etc. Presently, Fiber to the Home is available only in Clinton, Corinth, Flora, Jackson, Ridgeland, Quitman, Starkville, Madison the City and portions of Madison the County. Apparently, you pay $10 to preregister for it. Once enough people in the area preregister, CSpire will then lay the infrastructure and fiber. Rankin County Supervisors are meeting right now with CSpire representatives concerning Fiber to the Home in the Reservoir/Flowood area. Does any readers have it, or know someone that does? If so, tell us about it from a consumer's prospective (in the comments section). The PRVWSD recently signed a franchise agreement with CSpire for all of PRVWSD's property. CSpire has not provided an estimated date for pre-registration on PRVWSD leasehold land. Congratulations go out to Madison Berg, a Northwest Rankin Cheerleader, for winning the Miss Mississippi High School Pageant. 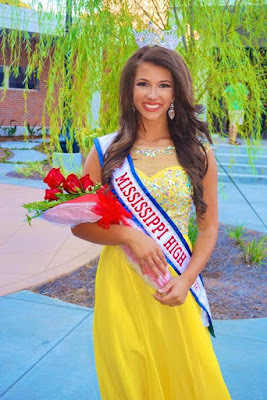 Madison will represent NWR, and the entire state of Mississippi, in the National Miss High School America Pageant. The move from one side of Dogwood to the other ends Monday, August 17. 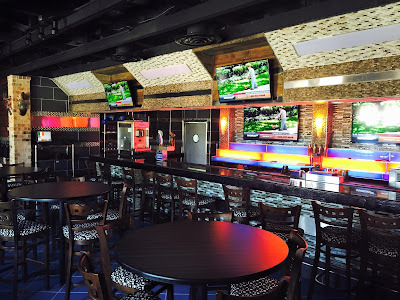 El Sombrero of Lakeland announced the finishing touches are being completed on their new location (the old Up the Creek Fish Camp). Lakeland Presbyterian Church host a concert featuring Jim Cole on Sunday, August 23, 2015. This is a free event, and open to everyone. The doors open at 5:30 p.m. The concert starts at 6 p.m. Motorists on the Spillway may have noticed red bouys surrounding the City of Jackson's intake structure. Per John Sigman, those bouys were placed by the City of Jackson for safety purposes while the city performed maintenance to the intake facility. As previously noted, the once public boat ramp at Safe Harbor Landing is now leased to the Sunset Marina. The previous tenant at Safe Harbor had their legal issues with the PRVWSD. The property was in a mess (as clearly evidenced by Jim's pictures in the prior link). Now, the location has been turned around by the new proprietor, Sunset Marina. Check out their home page here. Sunset Marina sells, services and stores boats. They have dry indoor storage and boat slip rentals. 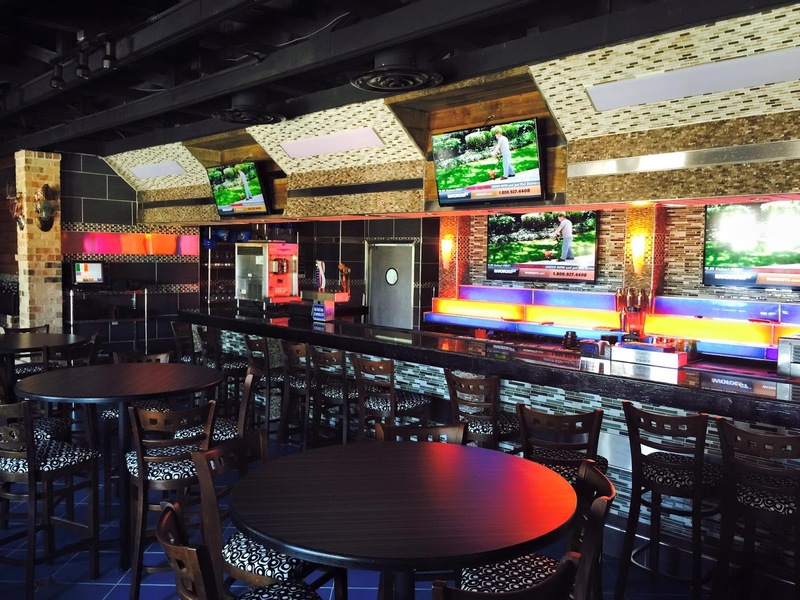 In June, the PRVWSD Board of Directors granted Sunset Marina the ability to put a restaurant on site. The application period for the PRVWSD draw hunts is in full swing. Not much has changed since last year except now, if drawn, you (and a buddy) have a full six days to hunt, rather than just four day. The prices for the draw hunts are the same as last year, $200 for Pelahatchie Bay, $300 for below Spillway. PRVWSD Hunting and Fishing Page. General Hunting Regulations for PRVWSD Lands. I failed to mention in all the election result hype that District 5 Supervisor, Jay Bishop, sailed to victory over Ronnie Garner with nearly 70% of the vote. Many may not know that Jay's territory covers a number of Rez neighborhoods. Take a look at the Rankin County GIS map, select the "Supervisor Districts" layer, and note how District 5 not only includes Flowood subdivisions Belle Meade, Latter Rayne, Lineage Lake, Dogwood, Oak Ridge, Indian Creek, but also (in some of the oddest gerrymandering around), takes in the various Barnett Bends, Oak Grove, Pinehaven, and Riverchase subdivisions. The old Rapids on the Reservoir location, the NWRAA soccer fields, those are all District 5. The High Heaven Trampoline Park, opening soon in Flowood, is active on their Facebook Page. The site administrator predicted a grand opening for the Park in October. They would start booking parties in September. They have pictures up of the "ultimate ninja obstacle course," "Dodgeball Tournament of Death", and the "trampoline wall". The 22,000-square-foot indoor park will feature 12,000 square feet of trampolines, including a large open trampoline field, a trampoline dodgeball stadium, slacklines, dunk basketball hoops and Olympic Foam Pits with over 50,000 cubes of foam. In addition, HighHeaven will have a Ninja Warrior Aerial Obstacle Course, the first of its kind in Mississippi. HighHeaven will host birthday parties, corporate events, dodgeball tournaments, trampoline aerobics classes; and it’s famous ClubHeaven—special weekend club nights with laser lighting and live dj music. District 2 Supervisor, Rodney Keith, posted about a burn ban in place for Rankin County. The Reservoir Community District Facebook Page continues to be a great source of information. -- 28,827 total votes cast in Rankin County this year. That's down nearly 7,000 from the last State and County-wide election in 2011. -- Lt. Governor, Tate Reeves improved by 25.6% of the vote over the last time he had a primary opponent. -- Rankin County Republicans resoundingly rejected Madison Mayor, Mary Hawkins-Butler. -- When your opponent is an incumbent with football stadiums named after him, no matter how much outside money you throw at him, he's going to be tough to beat. -- Swales remains strong. Has this guy ever lost an election? -- No county-wide run-off; David Ruth and Sue Townsend won their respective elections without need for a run-off. It's a new day at the Rankin County School District. -- In District 2, Kyle Brown ekes out 50 more total votes than Daniel Cross. Those two head into a run off. -- In District 4, Steve Gaines brings in 693 more total votes than his next closest competitor, Kenny Miller. It's not enough to avoid a run-off, however. Those two tee it up again on August 25th. 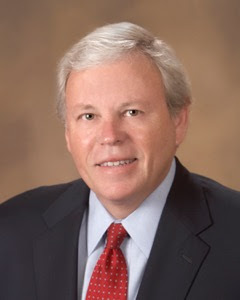 -- Justice Court Judge, John Shirley, is a juggernaut. His opponent, Tommy Whitfield, ran (what I consider) a good campaign, and Shirley still won with 73% of the vote. What are your thoughts on the elections? Be sure to follow me on Twitter this evening as I keep you up-to-date on Rankin County election results as they come in. @usmjacksonalum. I will be at the Rankin EOC building where the counting takes place. Tweet at me if you have a specific race you are following and I'll do my best to provide an update. The polls don't close until 7 p.m., so I don't expect ballot boxes to return to the EOC building until 7:30 p.m. or so. The Flowood Library hosts an elder care event in conjunction with AARP and elder caregivers in the Reservoir area. Voting begins TOMORROW (Tuesday, August 4, 2015) for the 2015 Primary Election. We encourage all Mississippians to head to the polls to cast a ballot in the upcoming election. It is has come to our attention several anonymous campaign mailers have been sent statewide. These mailers are not only gutless, but illegal. This type of politics denigrates the entire voting process, promotes voter apathy and discourages future candidates. We believe in the right to free speech, but we also believe in the right to recourse. We encourage Mississippians to consider their source of information when choosing a candidate and rely on credible resources. I note a concerned Reservoir citizen started a petition on change.org to gather signatures in opposition to the proposed restaurant on Spillway Road (read about the restaurant here and here). The petition is called "STOP Seafood Restaurant Proposal on Spillway Road", and currently has 97 signatures. Here is the link. We had an interesting conversation around the teppanyaki at Ichiban last night; few around the table knew the location of their voting precinct, where they should vote. One person from Laurelwood thought it was the Laurelwood clubhouse. Incorrect. One person from Regatta thought it was St. Mark's Church on Grant's Ferry. Also wrong. Things have changed, especially if you did not vote in the Senatorial election last year. There are two easy ways to determine the correct voting location: 1) use the Voter Record Search on the www.rankincounty.org website; or 2) find your precinct on the official Rankin County GIS map (make sure the "Voting Precincts" layer is checked). Once you know your precinct, find the voting booth address on the Precinct Spreadsheet. ***LAURELWOOD RESIDENTS, I note the Precinct Spreadsheet is incorrect for you. You will note be voting at the Flowood YMCA. Instead, you will vote at Mississippi Organ Recovery Agency, across Liberty Road. Hopefully, there will be plenty of signage to direct confused voters to MORA.